After a long day hard at work, John, the woodcutter looked for a refuge to spend the night. He came across an abandoned house and he pushed the door, so that it creaked and went inside to have a look around. – “This is so abandoned!” – he said in a low voice while observing the place. He dropped his bag on the floor, saying “I will try to sleep for a bit”. Then he put some blankets between some wood furniture. John was placing his things in the house when he realised that somebody else had forgotten a small goblin!…Poor goblin! It had fallen behind old dusty boxes, and had a broken arm! Maybe he had fallen over and broken it. He lay there alone and forgotton. Maybe he was cold, maybe he was afraid? John ate a little snack and looked at the forgotten goblin: “What are you doing here? Somebody has left you alone?…Well, I am alone too, so we can be friends” – said John – “Do you know what? my name is John, I work in the forest. I am very, very tired and will sleep here with you”. – He spoke to the little goblin, who looked at him as if he was listening to what the man was saying. John talked and talked, telling his stories to the goblin, who was motionless, just listening; until John finally fell asleep. Night passed and the day arrived with a strange sun cast his rays through the windows, and his light woke up the woodcutter. He picked up his stuff and looking at his friend said: “Come on, I’m taking you with me, I´ll fix your arm if you help me to cut firewood”… – he laughed. The goblin seemed to be really happy! Back at home, John made a clay arm, painted it and then glued it on the little, once decorated goblin. “That looks really good on you!” – he said, and put it on the table – “I will call you Franky” – he added, and then he sat in the shade to rest. The woodcutter went back to work and Franky was alone at home. Suddenly, the goblin began to move his arms and his legs! A noise was heard… What was that noise? Franky was walking! and he jumped off the table on his own! 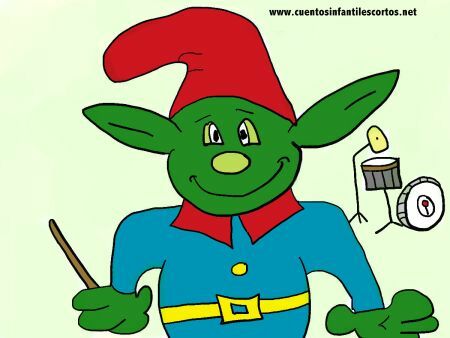 He was so happy to have an arm and a new house that he had become a real goblin! – “I´m so strong!” – he shouted; and hid under the bed to give a surprise to his friend. When John arrived home he looked for Franky everywhere: “Franky, Franky!”. Suddenly, he heard “achoo!… achoo!” – “Who is that?” – he said, but he did not see anyone, the goblin appeared from under the bed. “Well, don´t work too much my friend! You will get tired!” – interrupted John laughing. – Goblins are magic, we have powers, I will turn you into a very rich man soon! – claimed Franky. – “I have enough if you are my friend!” – said John leaving his tools on the floor. Meanwhile, the moon, that was hiding, appeared smiling, and lit up the forest.